An ambitious maker has built a partly 3D-printed railgun that can fire aluminum or graphite projectiles at over 250 meters per second (560 mph). No, this isn't Quake, but it's no janky, all-plastic gun, either. The "handheld" weapon houses six capacitors that weigh 20 pounds and deliver over 1,800 joules of energy per shot. And it indeed works just like a full-sized railgun, using parallel electrodes to fire an "armature" bullet. The creator, David Wirth, added an Arduino Uno R3 to monitor charging levels, temperature and other factors, and tweaked the rails after he noticed "plasma damage." 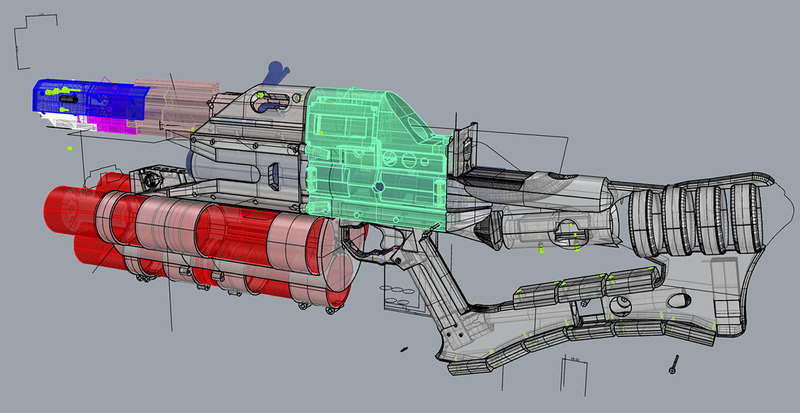 The resulting design was complex enough that he even made a 3D CAD drawing that would do DARPA proud (above). The test shots with graphite and aluminum projectiles were far less lethal than a regular gun, as you can see in the videos below. Nevertheless, the aluminum "bullet" still put a half-inch dent in the steel-backed plywood target, and the graphite projectile "probably just vaporized," according to the Wirth. Update: The post originally said that the gun fires 3,000 kilojoule shots, but the correct number is 1,800 joules.